We offer several types of clasps and fasteners to close your cloak, robe, cape or whatever else you want to keep closed. 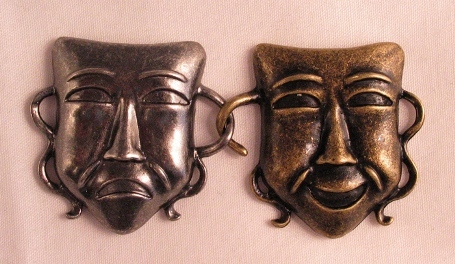 Different styles of fasteners will complement your Faire, SCA or Renaissance Costume, velvet garments, and goth clothes. Not all clasps are suitable for all garments, we do not recommend the smaller claps on heavier items. 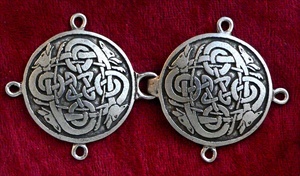 The recommended clasps for cloaks and heavy gaments are: our Rams Horn Pewter clasps (all types), Leaf Clasp, Bustier Clasp, Fleur de Lis Clasp, Heart Clasp, Trivet Clasp, Modern Clasp, and Classic Clasp. Ask us if you have any concerns. 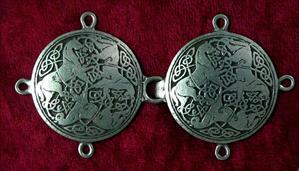 Our Rams Horn Pewter Clasps are made by artisans in the U.S.A.
Rams Horn Celtic Canines Cloak Clasp. Rams Horn Trinity Cloak Clasp. Rams Horn Horse Cloak Clasp.